This peyote stitch ring is a little out of our design comfort zone, but it has quickly become one of our favorites. The metallic steel colored beads give it an industrial edge (steampunk) and contrast really well with the matte, red beads used to make the heart design. And the width of this ring—almost 5/8 of an inch—will make sure that people notice when you wear it! And, of course, it can be made in one quiet afternoon or evening of beading. 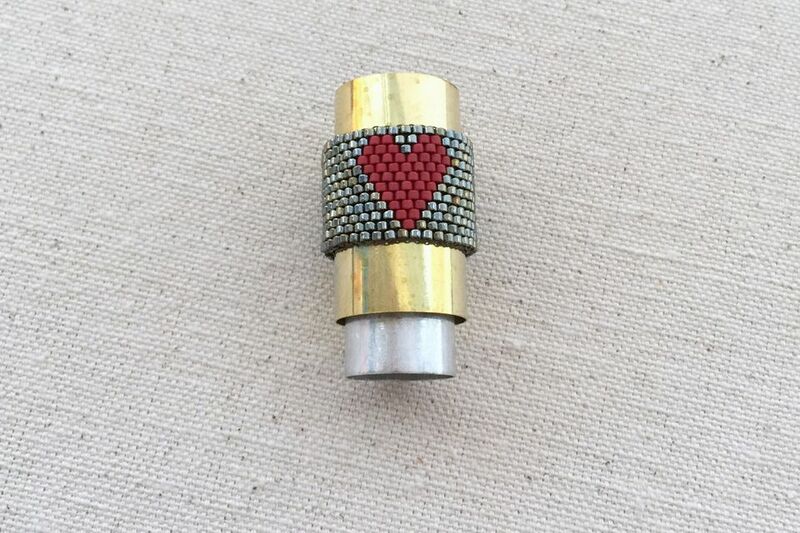 You will need two colors of Delica beads for this ring, one color for the background and one for the heart. We are using metallic dark steel for the main color and matte opaque red for the heart. We are also using Fireline beading thread and a tulip beading needle. This is one time that it will be helpful if you can work with more than an arm's length of beading thread. We used a length of thread that spanned both arms and still had to add some extra thread—which we like to avoid if we can. Our ring is a size 8.5. Begin by picking up twelve of the steel colored beads for the first two rows. This ring uses flat even count peyote stitch. When the peyote strip is long enough, you will zip the two sides together to form the ring. We sometimes have trouble starting the first row of peyote stitch. One solution that we've come up with, is to separate the two rows of beads by putting another needle (no thread, just the needle) through every other bead to separate the beads into high and low beads. This only takes a minute to do and makes it much easier to stitch the next row. Once the needle has been put in place, you can easily see which beads are up beads and which are down beads. Start even count peyote stitch like you always do by picking up a bead, skipping the first bead on the row, and stitching into the second bead. The only difference is that with the needle in place, it is extremely easy to see which beads you need to stitch and through— and super easy to stitch through them. Before we started stitching, We roughed out the size strip of peyote that would fit on our finger. We used blue masking tape because we knew the ring would be thick which meant that we would need a larger size than we normally would. To approximate the size, we wrapped the blue tape around our finger and marked the spot on the tape where it was a full circle. The bead chart for the ring is later in the slideshow and there is also a word chart of the pattern available. As with all peyote patterns, it helps to be familiar with how to read an even count peyote pattern. Lucky for us, we were stopping to take pictures of our work in progress! It helped me to notice a mistake before we got very far past it. Here is the corrected design. Just one red bead in the wrong spot and our heart would be lopsided. When our peyote strip is getting close to the right size (as measured by our masking tape), we wrap it around our finger to test it for size. Even when using Fireline, which isn't supposed to stretch, we find that these types of rings get slightly larger when you wear them. We purposely made ours to fit snug. In order to zip the sides of the peyote together, make sure there is an up bead on one side and a down bead in the same location on the other side. Stitch through the up beads on each side. This is like joining the teeth on a zipper, which is why it is referred to as zipping the sides together. It can be difficult to do while keeping the thread tension tight, so let it go slightly loose and then pull snug once you are done stitching the sides together. The top image is the peyote pattern for the ring. The completed ring is a very wide band. We especially like the way the light reflects off of the steel colored beads and the matte beads of the heart recede into the background. And if we grow tired of the heart, we can just turn it to the back and the ring appears to be one color. The heart is our secret.